Waterfall Info: From the bottom, this is the second significant waterfall on Moccasin Creek. It's the most spectacular waterfall in the Moccasin Creek watershed. Numerous other cascades and small waterfalls are found along Moccasin Creek, but none except Hemlock Falls are distinctive enough to be named. The creek as a whole is among the most scenic in Northeast Georgia. 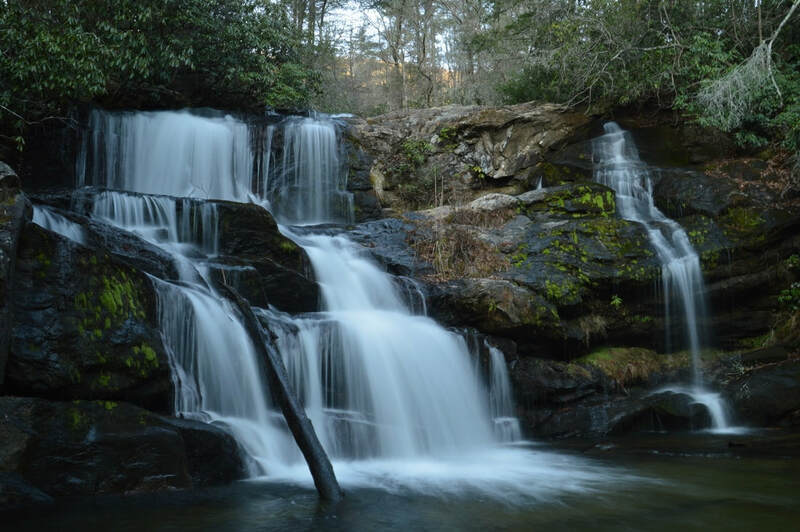 Access Info: This waterfall is accessed via the Hemlock Falls Trail, which begins at the end of Andersonville Lane off Highway 197, directly across from Moccasin Creek State Park. After the Hemlock Falls Trail ends at Hemlock Falls 1 mile from the trailhead, one can keep following an unofficial trail 0.7 miles all the way to Upper Moccasin Creek Falls. The trail crosses Moccasin Creek near the top of Hemlock Falls.